OCEANSIDE — For decades, Brother Benno’s has provided food, clothing and other services to Oceanside’s homeless population. But that could change after city officials review the nonprofit organization’s conditional-use permit. The city of Oceanside has been receiving complaints from businesses neighboring Brother Benno’s Center, located on Production Avenue, about the organization. According to City Manager Michelle Skaggs Lawrence, the city received a petition signed by more than 40 business owners in the park asking the city to review the organization’s permit because of its “perceived negative impacts” on its business neighbors. “The city was obligated to follow up on this request,” Skaggs Lawrence stated via email. The permit was first provided to the organization in 1990 and later amended in 1993. It establishes the center’s hours of operation and states that security shall be provided during those hours. Many of the complaints involve activity happening outside of Brother Benno’s operating hours. Kirsten Hunt, who co-owns LP Fishing Supply just across the street, said she and her business neighbors have had problems with property damage and theft. She added that she’s even had someone come inside her store and threaten her. According to Marco Gonzalez with Coast Law Group, the attorney representing Brother Benno’s, the organization provides a critical service not being provided by the government. According to Gonzalez, the city and Brother Benno’s have had many similar discussions since the organization opened. Brother Benno’s first started in 1983 as a soup kitchen in downtown Oceanside. In 1991, the Brother Benno Foundation moved its services to Production Avenue. When Hunt first moved into the location about three years ago, she said the homeless situation was much worse. When the Oceanside Police Department’s Homeless Outreach Team (HOT) stepped in, the incidents happening outside and to her store decreased, but she said it seems as if recently it’s growing worse. Hunt reports each incident she sees to the police, as she said she was instructed to do by HOT officers, but recently she’s been frustrated by law enforcement’s response. “We’re doing what we’re supposed to do and calling on everything, but now we’re being told to quit,” Hunt said. Sgt. James Ridenour manages the HOT team, which consists of two other police officers and a social worker. According to Ridenour, the outreach team uses a “non-enforcement” approach and tries to contact homeless people to find out their needs. The team’s goal is to get those people off the streets, Ridenour said. Brother Benno’s is one of the many service providers that HOT works with in the city. While HOT specifically takes a non-enforcement approach, other police teams handle the criminal side. Ridenour still encourages business owners in the park to continue contacting the police, and also encourages them to reach out to him as well for non-emergency services. According to Hunt, it is only “5 percent” of the people using Brother Benno’s services causing problems on a weekly basis. The rest are fine, she said. For Hunt, the situation is tough because she doesn’t want to see Brother Benno’s services go away. “People need help,” Hunt said. She also isn’t sure that limiting Brother Benno’s services or removing them altogether from the industrial park would help the problem. The park is located near the San Luis Rey River, where there are several homeless encampments. Hunt would like to see better funding for HOT and an increased police presence with a “better attitude,” adding that businesses in the industrial park are treated as “second-class citizens” when compared to downtown Oceanside. Ridenour understands the frustration business owners may feel in regard to response times, noting staffing numbers at the police department and the size of the city. The recent passing of a half-cent sales tax posited to raise revenue for emergency services in the city, and Ridenour hopes to see increased funds for the police department to help mitigate staffing issues and improve response times. Geoff Hunt, who co-owns LP Fishing Supply with Kirsten Hunt, said he would like to see Brother Benno’s have an onsite security guard. When people drop off donations after hours, Geoff Hunt often notices items strewn on the ground by people tossing aside things they don’t want. Skaggs Lawrence confirmed that the city also would like to see 24-hour security at Brother Benno’s, and the city is currently discussing options with the organization. There were 483 homeless people in Oceanside this year, according to the annual point-in-time count of San Diego County’s homeless populations, prepared by the Regional Task Force on the Homeless. That number represents 6 percent of the total homeless count. 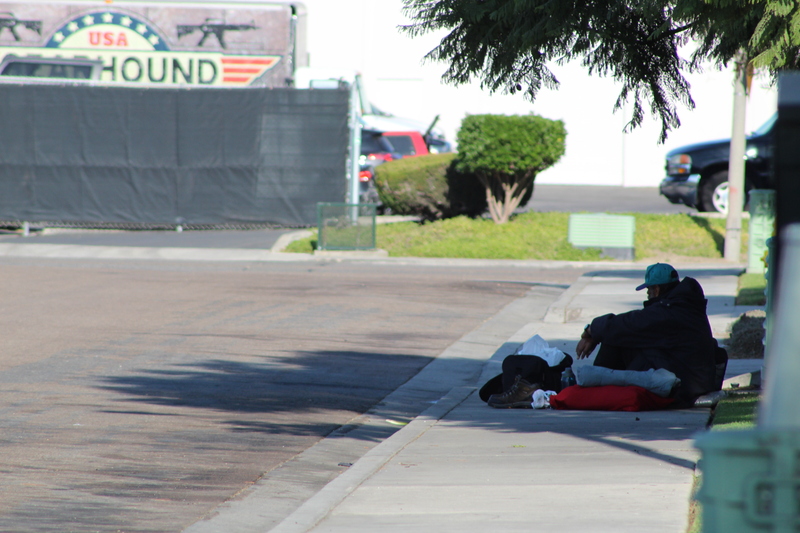 This year, Oceanside saw a 10 percent decrease in unsheltered homeless individuals.